The University of California, Berkeley, today (Monday, Jan. 24) announced that former Michigan Gov. 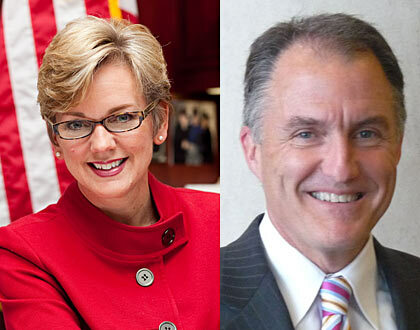 Jennifer Granholm and her husband, Daniel Mulhern, will teach interdisciplinary courses on energy, leadership, state budgets and the economy at UC Berkeley’s schools of law, business and public policy. The academic appointments will begin this semester. The former governor will teach several courses and work closely with UC Berkeley’s think tanks on public policy, law, business and the environment. At the Goldman School of Public Policy this spring, she will teach about state budgets, clean energy jobs, diversifying the economy, and leadership; in the fall, she will add a course on state budgeting and governing in times of fiscal crisis. She became a federal prosecutor in Detroit in 1990 and was elected Michigan’s first female attorney general in 1998. In 2002, Granholm was elected governor and was re-elected in 2006. As part of her goal to double the number of college graduates in Michigan, she signed into law a college prep curriculum for every high school student in the state and some of the toughest turnaround requirements in the nation for low-performing schools. In 2007, she launched the No Worker Left Behind program for displaced adults, in which the state of Michigan pays the community college or technical school tuition of any unemployed and underemployed citizen seeking training for a high-demand job. Under her leadership, despite the implosion of the auto industry, Michigan won recognition by the Pew Center on the States as being one of the best managed states in the country and one of the top states for adding new business expansions. Mulhern is a leadership coach; the host of “Everyday Leadership,” a radio show on the Michigan Talk Network; and the author of two books: “Everyday Leadership: Getting Results in Business, Politics and Life” (2007); and “Be Real: Inspiring Stories for Leading at Home and Work” (2010). Mulhern will teach two courses in the fall semester of 2011, one on gender, work and leadership to be offered jointly by the Goldman School and Berkeley Law, and another at the Haas School of Business on leadership. He graduated from Yale University in 1980 with a degree in religious studies and from Harvard Law School in 1986. Mulhern also will join faculty affiliated with Berkeley Law’s Chief Justice Earl Warren Institute and its project on health, economic and family security. Mulhern and Granholm are writing a book together on governing the toughest state in the country during a major economic meltdown, and what Michigan’s experience can mean for America.